Born in 1984, Taryn Beri specialises in taa moko (cultural tattooing) and contemporary Māori painting. Her journey as a professional artist started in 2008 when she moved to Gisborne to attend Toihoukura Māori Art School where she studied for one year. Following that, she began an intense one-on-one taa moko apprenticeship on the East Coast of New Zealand with a tohunga (master/expert) cultural tattooer. For three years she learned the tikanga (protocols), culture, techniques, patterns and designs associated with the cultural practice of taa moko. In 2011, she also studied Mātauranga Māori (traditional knowledge) for one year at Te Wānanga o Raukawa. In 2012 Taryn set out on her own to develop her art practice as a full time professional artist. Prior to 2008, her background was in Māori fashion and adornment design, graphic design and business management. Taryn has been involved with exhibitions at venues such as Te Papa Tongarewa National Museum of New Zealand, The Royal Ontario Museum (Canada), The Field Museum (Chicago), Musee du quai Branly (Paris), Ora NY Gallery (New York), Museo de la las culturas (Mexico City) and Musee de la civilization (Quebec) among others. 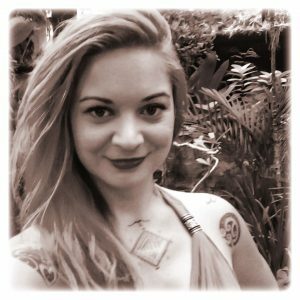 She travels extensively throughout New Zealand and around the world tattooing, painting and exhibiting. Her favourite destinations to visit so far have been India, Egypt, Tahiti, Paris, Dubai, New York and Bali. She draws great inspiration from the different cultures, peoples and styles of art that she encounters on her journeys. The Divine Feminine and ngā atua wāhine (Māori goddesses) are a big source of inspiration for many of her paintings. Two of her biggest art idols are iconic Māori artist Robyn Kahukiwa and world renowned Mexican artist Frida Kahlo whom she has been inspired by from a young age. In late 2013, Taryn gave birth to a beautiful baby daughter. Themes of motherhood, conception, creation, birth, ancestral memory, transformation, personal growth, DNA information and the continuum of whakapapa (genealogy) from ancestors to offspring also appear in many of her art works. Her ancestors Te Rauparaha and Nohorua as well as their relation, the famed Te Rangi Topeora, also inspire many of her art works and ideas. Māori cosmology, the stars, moon, sun, lightning and other natural phenomena often feature in her artworks. The inter-relatedness, similarities and commonalities between different indigenous groups of people around the world is of great interest to her. Taryn belongs to the Ngāti Toarangatira, Te Ātiawa and Ngāti Raukawa tribes. In 2010 she was given an award for emerging Māori artists by the New Zealand government organisation, Creative New Zealand. Her latest work at The Sound Temple has comprised hosting a Wahine Power Circle and her solo exhibition Purapura Whetu solo is currently installed until middle of October 2017. Taryn is currently traveling the world with her family living her dream. As well as tattooing and painting, she is also currently exploring spoken word poetry, book publishing, and running her own workshops and art salons around the world. She has a special interest in inspiring and empowering women to lead their best lives as their best selves. To see more of Taryn’s work visit www.tarynberi.com and www.toitangata.com.